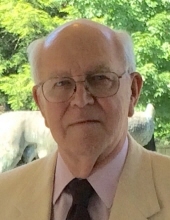 DURHAM: David J. Lansdown, 85, passed away on Friday, March 15, 2019 at the Brian Center Health & Rehabilitation in Durham. He was born in Lincolnshire, England to the late Vincent Lansdown and Moeva Burnette Lansdown. In addition to his parents, Mr. Lansdown was also predeceased by his brother, Roger S. Lansdown. Mr. Lansdown had a passion for soccer, especially his hometown team, the Lincoln Imps. He also loved books and steam trains. Mr. Lansdown retired from UMICO National Insurance (formerly UTICA Mutual) as a Systems Analyst. Mr. Lansdown is survived by his wife, Dorothy Lansdown; children, Barbara Ritchie (Peter), John M. Lansdown (Helen Ann), Peter B. Lansdown, Mary Parker (William), William D. Lansdown; and grandchildren, Nigel Lansdown; Hannah Ritchie, Dylan Ritchie, Spencer Parker, Griffin Parker. Services will not be held at this time. To send flowers or a remembrance gift to the family of David J. Lansdown, please visit our Tribute Store. "Email Address" would like to share the life celebration of David J. Lansdown. Click on the "link" to go to share a favorite memory or leave a condolence message for the family.